Maybe I’m just a science nerd at heart, but I can’t seem to get enough of horseshoe crabs and their annual arrival, by the hundreds of thousands, on the beaches of the Northeast to lay their eggs. If you grew up along the ocean waters of New England or the Mid-Atlantic, you may fondly remember this from your youth. Maybe you don’t even know why or recall exactly when this would happen, but no one can ever forget the image of their local bays filling up with these strangely lovable hard-shelled critters. This annual spectacle is truly one of the greatest natural phenomena in the world. For those of us who have lived in New England for a long time, you are probably saying “there used to be so many more of them when I was younger”. You’ll be happy to hear that this isn’t just the rose-colored overtones of nostalgia making everything seem like it was so much better “back in the day” - the populations of horseshoe crabs really have declined over the years. In fact, I read a study that said that 90% of the horseshoe crab population of Massachusetts had been wiped out through the 1990’s, due to overfishing of these creatures, mostly to use as bait for commercial fisheries. Horseshoe crabs are actually not crabs at all. They are more closely related to scorpions and spiders. And they have blue blood! Based on copper instead of iron, this blood is used in the biomedical industry to create solutions that detect the presence of bacterial pathogens (quiet, science geek talking). While the species is currently in a hopeful recovery period, if you still want to see the sheer numbers of horseshoe crabs that you remember, you have to head down to the “hotbed” of the annual spawning phenomenon, the calm shores of the Delaware Bay, around Dover, DE and Cape May, NJ, where the populations have remained more or less stable over the last few decades. So that’s exactly what I have done, three times in the last five years. OK, so now you know the location. ...but evolution isn't perfect. Thousands of crabs get flipped over anyway, and they don't know how to right themselves. So to help out the species, if you see 'em upside down, flip 'em back. As I have learned through my visits over the years, if the weather is too cold or the water is too choppy, the crabs will not come up! This year, though, Allie and I went down to the Delaware Bay right after Memorial Day, and everything was perfect. We saw more horseshoe crabs than I had ever thought possible. If all goes well (see above checklist), this is what you should see at night! Photographing it requires a camera with good performance at high ISO, and the acceptance that the exposure time will be many seconds long. This is half an hour of horseshoe crab activity under the full moon, condensed into 10 seconds. The horseshoe crab phenomenon also attracts an entirely different species to the area: birdwatchers. Birdwatchers are drawn to the incredible variety of shorebird species that comb the beaches at low tide to feast on the freshly laid crab eggs. Not just for invertebrate geeks, this natural spectacle is beloved by bird nerds as well. 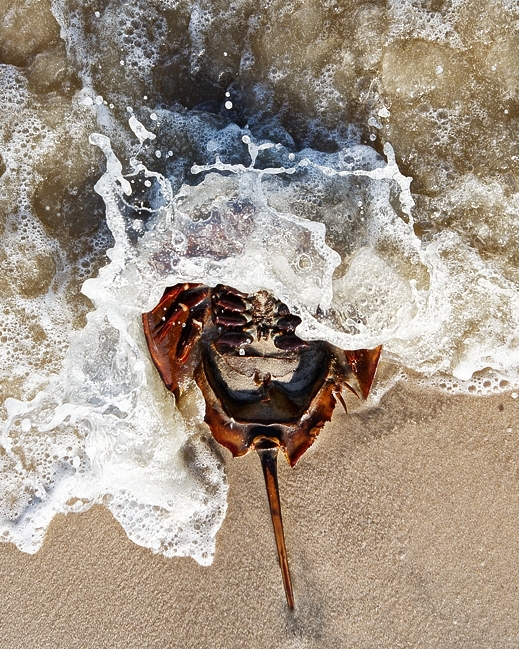 Read more about the incredible horseshoe crab spawning phenomenon here.